... if I simply swap these, ... will the front end be the same height? Apologies but I cannot make out what your plans are from your post. What car are these for? Are you planning to swap the stock springs on your existing stock struts with the SP-250 Welts? What do you mean by “strut assemblies complete with bushings”? I don’t know of any “bushings” on any 944 strut assembly. Generally the SP-250 Welts are designed to lower a stock ride height car by 1.25". How much your car will be lowered by fitting those springs will depend on how worn you current springs are. 9FF, thanks, and I do apologize for the haste. Current in-service struts are worn, want to replace with better and used pair. I have used Weltmeister-fitted struts - the whole thing is assembled, including the .. the ... strut mount (oh, that’s the term - sorry). So bare minimum of work to remove and replace. They will be fine, the height may be slightly lower but it won’t look bad or affect anything. If it rakes too much at the front you can lower the rear slightly using the eccentric bolt before you get it all aligned. 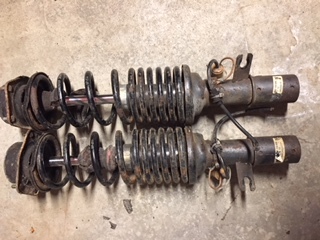 here's a pic (below, the next comment) of the pair of used strut assemblies I have - I'd be interested to know the function of the spring, specifically, what the ... different number of coils per inch (? ), at either end, is doing ...?.... on the same spring. That is a progressive rate spring. A linear rate spring will have the coils somewhat evenly spaced. Ideally, the closer coils are on top of the assembly. If you are removing the top strut mounts, inspect the bearing. Greast the upper bearing - just squash some fresh grease in with a popsicle stick but be sure you're not squashing dirt in also. Clean the seals first. You will need an alignment afterwards. thomasryan, thanks - I did not know that, very interesting. what is the "rate" - vibration frequency per second? then a pothole will make a low frequency vibration, and a low-frequency (low rate) spring should be matched to the pothole frequency? should I make a point to the spring put in the other way around then? what's an OK-off-the-shelf-from-the-FLAPS grease for this - lithium? The rate in our specs is pounds per inch in this instance. The work shop manual give the paint dot codes for the pounds per inch of OEM springs. A progressive rate spring might be 120 pounds for the first inch, 150 pounds/inch for the second inch then 180 pounds per inch for the third. Theoretically, progressive rate springs are more suitable for public streets where potholes abound. I’m back again - some questions. There’s a Koni cut a strut video [ https://youtu.be/PXSnNZt3NiI ] which says you need a 1/2” or 12mm drill bit. The instructions that come with the Koni inserts, labeled “1027 05 20 22 207/2”, say to cut a 14mm hole. There is a third piece of information from Koni [ http://www.koni-na.com/CorporateSite/media/itt/NA/pdf/boltstrut.pdf ] which says to use a 9/16” or 14mm drill bit. The outer diameter of the threads on the bolt that comes with the Koni inserts is really really close to 12mm or 1/2” and so is the outer diameter of the threaded mating surface on the bottom of the strut insert that the bolt mates with. Question is what diameter hole should be drilled into the old strut housing? 2. I have the Porsche bump stop - does this need to be cut? How would I know? Printout from website says subtract 7mm. Instructions with the struts imply 6mm (“L1=46mm -> L2=40mm”). 1. The reason for the varying online measurements for the hole is that Koni changed the bolt at one time. Just drill it sufficient to clear the supplied bolt. 2. Cut the Porsche bump stop and fit the Koni one, iirc they are different diameters anyway so the Porsche likely won’t fit the Koni insert. 3. 1mm isn’t going to make any difference. Lowering the 944 creates fender rubbing problems most aftermarket springs lower the ride height. If you want the same ride height then get new not used factory front springs after 30 years springs just sag.